Send me YOUR tea set, and I will transform it into a work of art!! This customer found a silver set on shopgoodwill.com, and sent it to me at my studio. 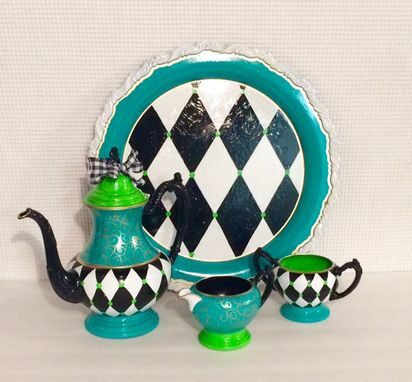 She opted for my harlequin design, but with lime green and turquoise. Those were my marching orders and here's the result! Totally amazing and the customer was blown away! Not for sale. But send me yours and I'll transform it! Yes, this is a silver tea set. Sent to me by a customer wanting me to add the artwork. 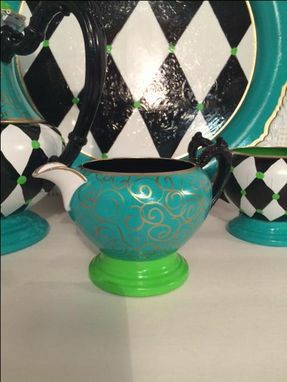 Painted to suit, your custom, hand painted treasure will be the envy of all who see it! I paint all styles, all patterns, all colors. Contact me if you want you own custom painted tea set. 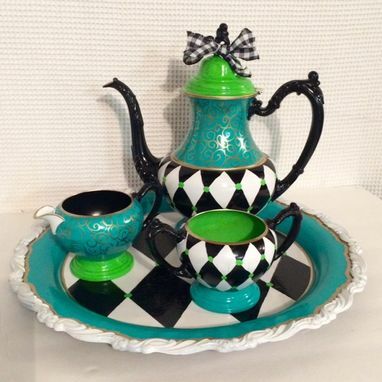 Prices start at $175 for the standard 3 pieces (pot, creamer and sugar bowl). Trays range from $59-$75 depending on size and design. 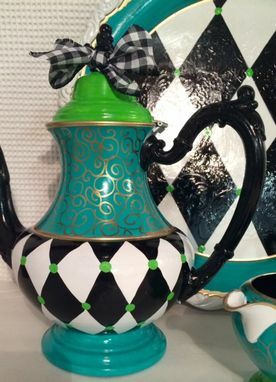 Extra tea/coffee pots are $85. Don't have a silver set? Just contact me. I'll show you how to find the perfect set, that meets your budget! ~~ I call my style "REFINED WHIMSY". Fanciful and fun, but with a feeling of sophistication and class. No sloppy edges here! If you're a person with distinctive taste, who appreciates unique, custom, heirloom quality, functional art, then I'm the artist for you. 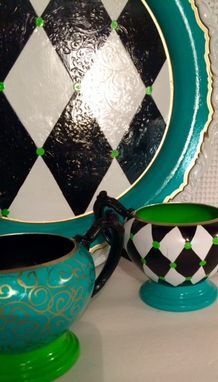 Every single piece in my gallery can be purchased and recreated, or we can work together to design a CUSTOM treasure, perfect for your space or for a special, personal gift. CUSTOM, HAND PAINTED FURNITURE and HOME DECOR. TREAT YOURSELF. YOU DESERVE IT!! I specialize in custom work, so while you can immediately purchase ANY item in my shop, I also work with customers all over the world, designing and creating special pieces just for them. Purchase with confidence. Here is a link to my Customer Ratings. Almost 2000 sales and a 5 star rating. I am very proud of that! Thank you for visiting my shop. I love to create, and I'm so excited to be able to share some of my artwork with you. Unless identified as READY TO SHIP, the listings in my store are painted BY THE ORDER. This allows for customization if desired, and ensures that each piece you purchase is unique, new and painted JUST FOR YOU. My pieces or yours. Lots of customers send me their items, to transform into a unique, whimsical art, to enjoy forever. Just contact me and we will "talk". I spend hours and hours in my studio, completing each project as quickly as possible. Since I paint small and large items, turnaround time varies. A vase will take closer to 1 week, while a large custom hutch may take 4-6 weeks. However, we will communicate through Etsy, to discuss your particular needs. Each customer gets individualized attention. Nothing here is mass produced or cookie cutter. How wonderful!!!! And painting to order means there is no limit on quantity, despite what the listing may note. Contact me. I would be honored and delighted to work with you!